MEL’O BURGERS Los Angeles – Good food. Bad location. 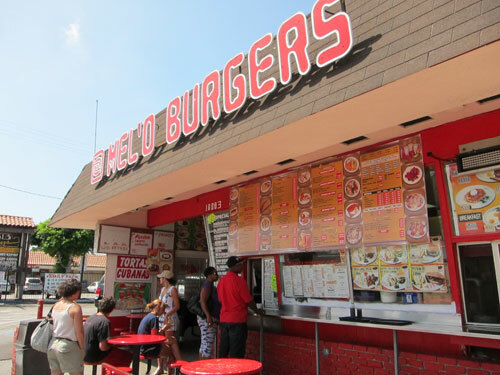 At the corner of Century and Inglewood in Los Angeles, California, is a small burger shop called “Mel’O Burgers.” I love little shops like this because the food is usually really good. This is the case for sure at Mel’O Burgers and they don’t have just burgers. Mel’O Burgers has a full Mexican food menu, breakfast items, shakes and many other selections. One problem with Mel’O Burgers is the location. This is a pretty scary area of town. When I was there, an obvious drug dealer who was working out of a motor home was parked in the parking lot. Cops drove by and he and his accomplices ducked for cover. I watched several “deals” go down while waiting for my food. I also had to deal with a homeless guy harassing my family. Copyright MegaChomp. All Rights Reserved.